Everyone has differing opinions on the level of maintenance that is necessary to keep your vehicle running at peak performance. It all depends on how much you value your vehicle, and how much time and money you are willing to put into it. Some people may have their car detailed every 6 months, as well as getting regular oil changes, fluid checks, and consistent overall maintenance. Others may not be interested in upkeep for their vehicles at all, with a “drive it into the ground” approach. Whatever your philosophy on vehicular maintenance may be, it is wise to at least sustain a bare minimum of upkeep to avoid hefty mechanic bills. Keeping your car clean with consistent washes is a good place to start. Many people find that they don’t have the time in their busy lives, to clean their cars regularly. As it turns out, getting your car washed by a professional is much more advisable practice. It is better for the environment as well as your vehicle. If you are looking for a reliable and affordable car wash service in the Brampton, Mississauga, Caledon, or Toronto area, In N Out Car Wash in Brampton is an ideal choice. With over 50 years experience in automotive maintenance service, the experts at In N Out have developed a level of quality and consistency that will leave your car looking fantastic after every visit. The goal at In N Out Car Wash is to offer first-rate services and products at affordable prices. Technicians use only top of the line equipment and cleaning products to make your vehicle shine. 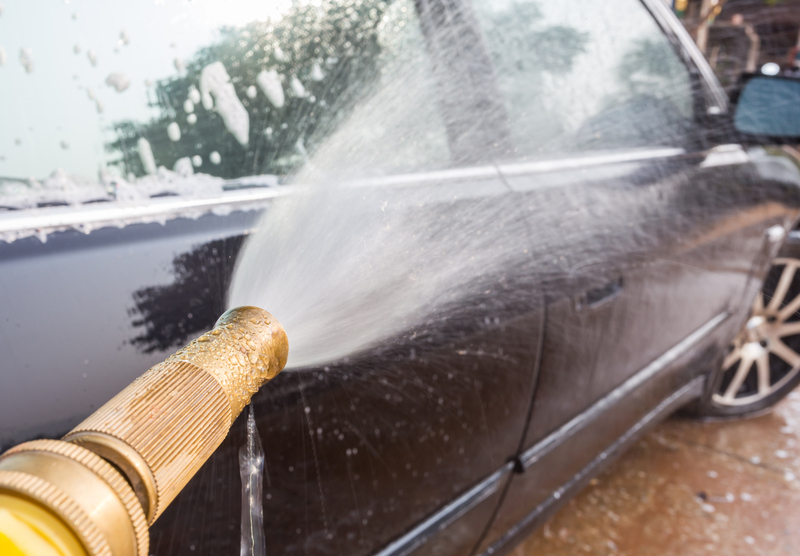 What are the advantages of having your car washed regularly by a professional? Everyone loves the look and smell of a new car. New cars are attractive, shiny, and they look terrific. Not to mention that new car smell. You can keep your vehicle looking and feeling new by having your car cleaned consistently. How often you would like to have your car washed, is left up to personal preference. Some people like to have their vehicle washed weekly for optimal results. The general recommendation is to have it cleaned every 2 weeks, if you want to keep a consistent level of clean. Dirt, debris, grunge, and dead bugs can accumulate on your car windshield making driving vision precarious. A build up of dirt an grime on the windows and mirrors can cause blind spots in your field of vision, increasing the risk of an accident or disaster. Keep yourself and your passengers safe with regular car washes. There have been arguments made that a dirty car is actually more fuel efficient than a clean car. This theory has been proven to be untrue. The claim that cars covered in particles of dirt are faster, is based on the aerodynamics of a golf ball. The divots on a golf ball reduce wind resistance, allowing the golf ball to travel faster than if it was just a smooth ball. However, this only works because of the symmetrical and precise design of the divots on a golf ball. Random dirt particles on the exterior of a vehicle do not serve to reduce drag like divots on a golf ball, but rather they increase wind resistance for your vehicle, causing it to use more fuel. A clean car is more aerodynamic and therefore more economical on fuel. Dirt is not only unattractive to look at, and irritating when it gets on your clothes, but it is also damaging to your vehicle. Dirt on the exterior of your vehicle can easily lead to scratches in the paint, which can end up being an incubator for rust and corrosion. Dirt left to linger on your car’s exterior can wear down the protective coating and cause fading in the paint job. You may not realize it, but the interior of your car is full of germs carried in by passengers that get in an out of your car (including yourself). You typically will use your car to travel to a variety of different places, bring germs from all these locations back into your car. Regular interior cleaning will help prevent a build up of unwanted germs, allergens and mites.